Let's try a less awful version of the Digital Foundry thread. I'll leave that one up for now to catch the crazies. Hopefully no mindless shitposting first response followed by a slew of drones and quotes. But I am looking forward to this title and what GG can truly push for with what time they have left. I'm guessing that GG has some extra space to breathe and it may not be a technical mess at launch even if it doesn't utilize everything off the bat. Are these the same slides from the lighting presentation or something different? EDIT: NVM, it's new. Reading now. My post from the next thread . So the KZ SF has 40k polys for highest LOD models while KZ3 was 10k . That is a nice jump along with a huge jump for textures. Also interesting to see what there engine going to look like when they move stuff to compute. 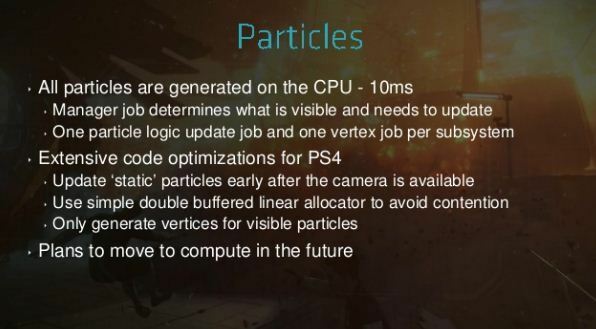 Interesting how they only used the CPU for the particles but are planning to move to GPU compute in the future. This and Watch Dogs are day 1 on my PS4. HNNNNNG. As said in the other thread: I hope they use it to increase the actual playfield, instead of just polishing up the backgrounds and graphics. Let people explore and use their own tactics instead of being funneled down a corridor. seems to just be a different angle in the same area. I remember reading that they planned to have bigger areas(not open world) but wider range of combat areas, don't remember where I read it though. It was in the lighting presentation. They show what it looks like with and without the various reflection passes. Pretty cool. The slides are really interesting and really goes in depth with what is allocated to what as well as many comparisons to KZ3. Good stuff. guerilla games have always very interesting slides. however, the 500 MB for sounds seems so unreal, even though the low-level cpu optimisation is missing. 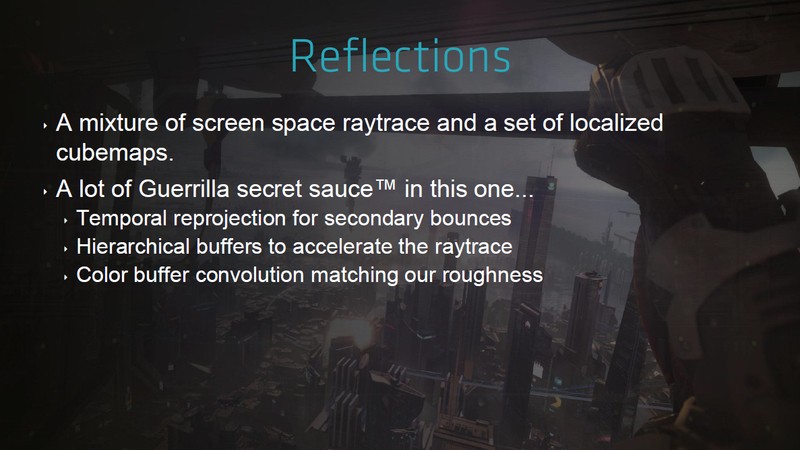 lol in one of the slides they have GG secret sauce for reflections . Not sure what they're comparing here to be honest. They both look...the same? 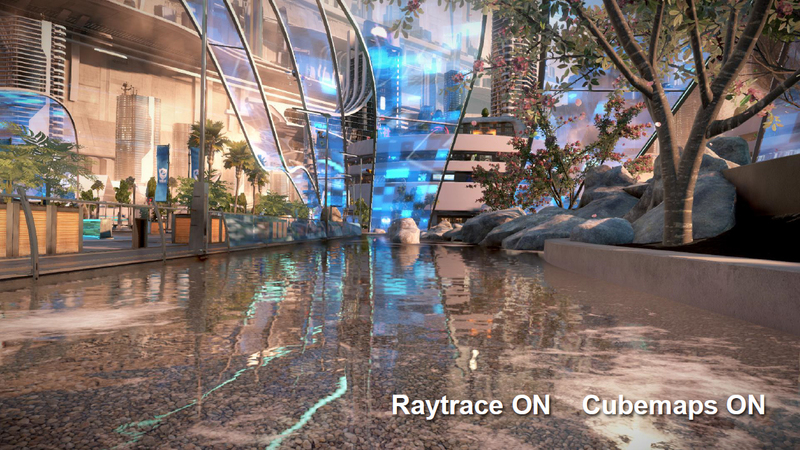 Is this the one with the comparisons between cubemap reflections vs cubemap + ray traced? That was really nifty. Subtle difference but I notice higher quality textures and better rounded edges (look at the fingers, top of the head, cape) benefiting from the higher poly count. You can see the differences a lot better in the mesh. Way more detail in SF and those cloth pieces are probably going to move this time around. ...and for now they are brute forcing particles on CPU only. That's a lot of vertices. Different character models? Maybe comparing the difference in design? Yeah they look pretty much the same to me to besides the minor aesthetic changes. We must have had a hiccup here. I wonder if they stuff they said they plan on moving from CPU to compute or various things they say aren't in at this time will be in SF or future games. I'd say next GG game. 2nd Gen PS4 games are going to be special . 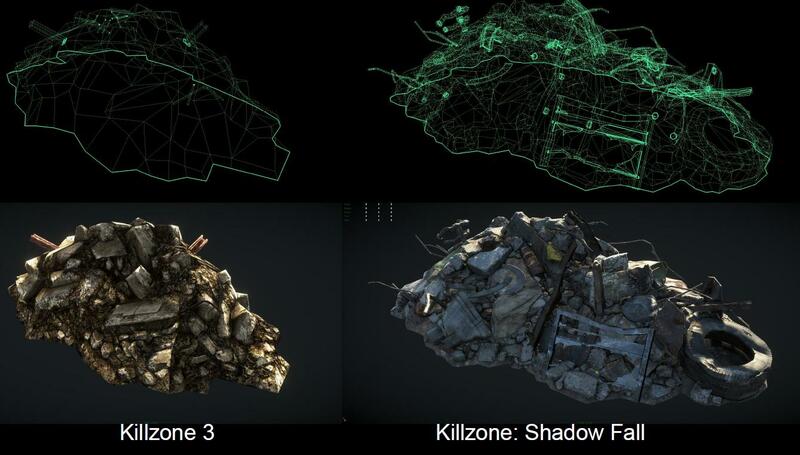 That Helghast's eyes are also being treated as dynamic lights in the KZ:SF model vs the KZ3 one, look at how the lighting is cast within the hood. Higher polycount is very noticeable on the shins and fingers. That Helghast's eyes are also being treated as dynamic lights in the KZ:SF model vs the KZ3 one, look at how the lighting is cast within the hood. Did not notice that but you are right . Also we are back . In the same ways devs spent a very long time moving things over to the Cell SPUs, things will slowly be moved over to Compute Shaders. It's one of the reasons why I think the Thief reboot being next-gen/PC only could be a great thing, as level design doesn't need to be constrained by the fact that the game also has to fit on 7-year old consoles with a 1/2 a gig of RAM in total. Of course, they could still funnel you down claustrophobic city streets and corridors the whole time. The comments of the slides are only in the ppt version and there are pretty interesting. Also there seems to be video embedded in the presentation but they don't play on my PC, don't know why. There are some great notes and tech demo video in the powerpoint copy of the presentation. We think that using jobs on the CPU is the right way to go and we consider it the best way of multithreading on more than 2 cores. And as we found out the hard way - avoid spinlocks. The GPU is really fast, but you still need to watch the number of shader outputs. Also the conditionals seem to be finally usable. The GDDR5 bandwidth really gives PS4 its wings. Of course you need to map the memory properly as explained in earlier talks. We can only add that even though the bandwidth is high, it&#8217;s still something you need to care about. Use small pixel formats where possible. We only had a single compute job in the Killzone demo used for the memory defragmentation so we&#8217;d like to know about your experiences." "We've only scratched the surface"
Notes on that are "Were not done yet! We still have time to optimize more before the game gets released." With the power of 3GB GDDR5 we can now raise his arms. We're at a point where to see graphical differences you really have to see stuff in motion, often direct feed, to really appreciate the jump. Elements like real time reflections, cloth physics etc. I guess it'll be tougher to sell. "This is a bit of an unfair comparison between the new and old character. Unfair because all the lighting model changes make even the old content look much better. weve stripped all but extremely subtle implied lighting from our diffuse textures. Weve also removed the fake lighting and Fresnel effects from the character materials. now with the new lighting model its used more to get better material expression. 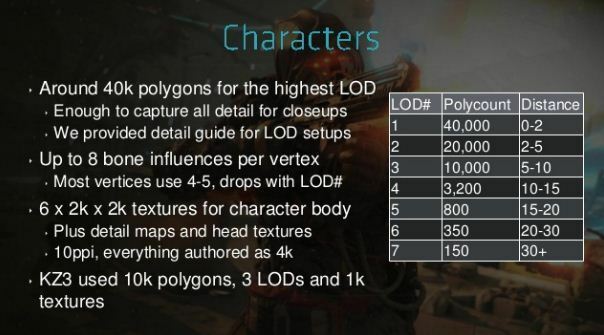 and the next slide is a video showing "the benefits of 7 LODs compared to the Killzone 3. 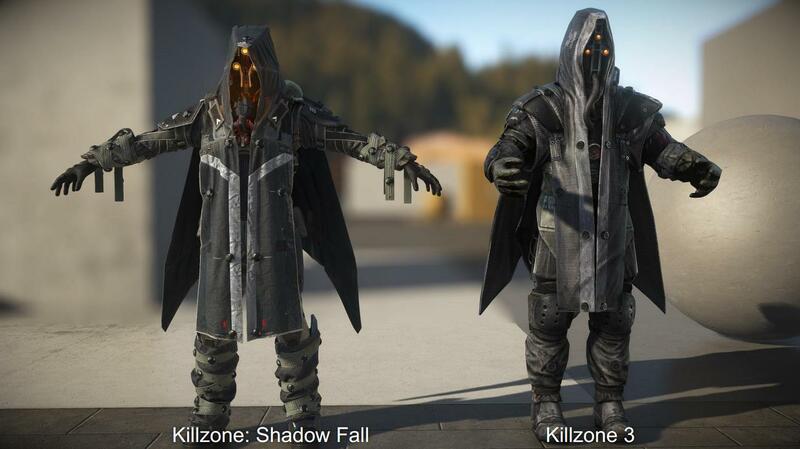 The left character is from Shadow Fall and the right one is from Killzone 3. Youll notice that we keep very uniform (screen space) vertex density even with lowest LODs." Extracting all video files. Will upload when done. Makes sense. They probably can't plan too far ahead for what can go where and what can be improved until they have final hardware. BTW where are the video and side notes in the ppt file? I can't find them. Compiling and then will upload soon.